HOT! Charmin Ultra Strong Stock Up Price with Store Pick Up! Home / Deals / HOT! 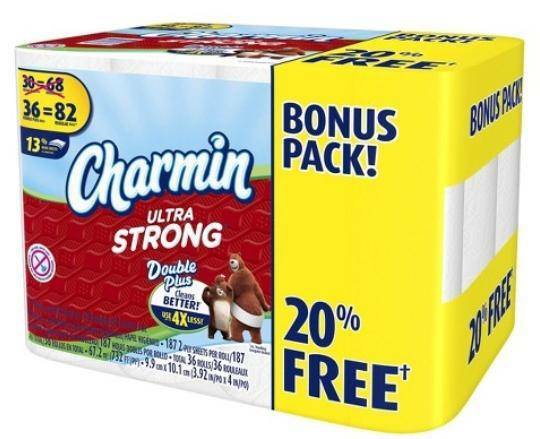 Charmin Ultra Strong Stock Up Price with Store Pick Up! If your local Target has this for store pick up, you can get an absolutely AWESOME Charmin Ultra Strong Stock Up Price! When you add it to your cart, this pack of 36 Double Plus Rolls (Equals 82 Reg. Roll) is $5.98 which is $0.16 per Double Roll and that is like $0.07 per Regular Roll! My store has these in stock, so I am hoping lots of you will be able to grab them, too and with the Free Pick Up you don’t even have to pay shipping! Just went to order, they are showing $15.99 for me in Missouri. Scott Extra Soft Toilet Paper Stock Up Price | $0.20 per Regular Roll! Amazon Fruit Snacks Coupon | $1.40 Per Box Shipped!